Is it possible to bank online securely? Yes, if you're careful. - Ask Leo! Is it possible to bank online securely? Yes, if you’re careful. 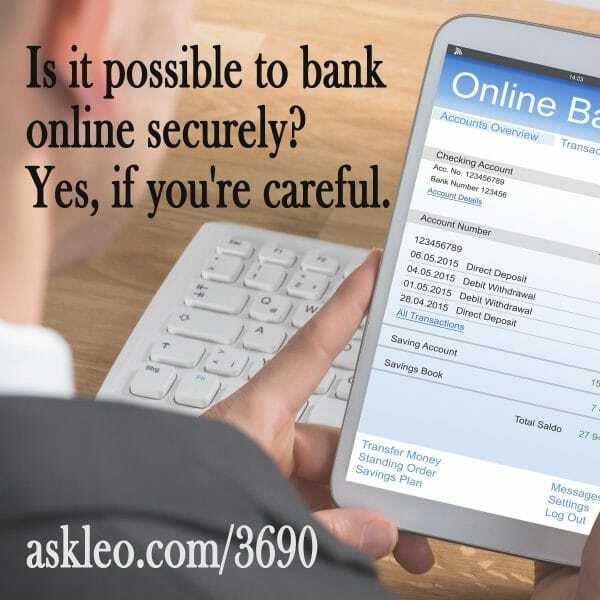 Is Online Banking Safe? - Is it possible to bank online securely? Yes, if you're careful. Does cleaning cookies force me to re-verify my bank log-in? - It's a pretty quick process to identify all the internet domains that need to be listed in CCleaner as exceptions so that you can easily log in to your favorite sites. How Could My Bank Account Have Been Hacked if I Have Good Security? - Even with seemingly appropriate security in place, things can happen. I'll review what things, and the additional steps you can take to protect yourself. « Previous post: Is Someone Trying to Hack My Facebook Account?